I wanted to write about my two Grandmothers. They were both so talented but in different ways. I feel like I inherited some of each of their talents. Grandma Iza Covert Dietz was the step-mom of my Dad, Raymond J. Dietz. She was a wonderful lady! Her talent was in her stitching and her knitting. She knew I loved horses and did a needlepoint of a horses head. I also took tap dance and ballet. 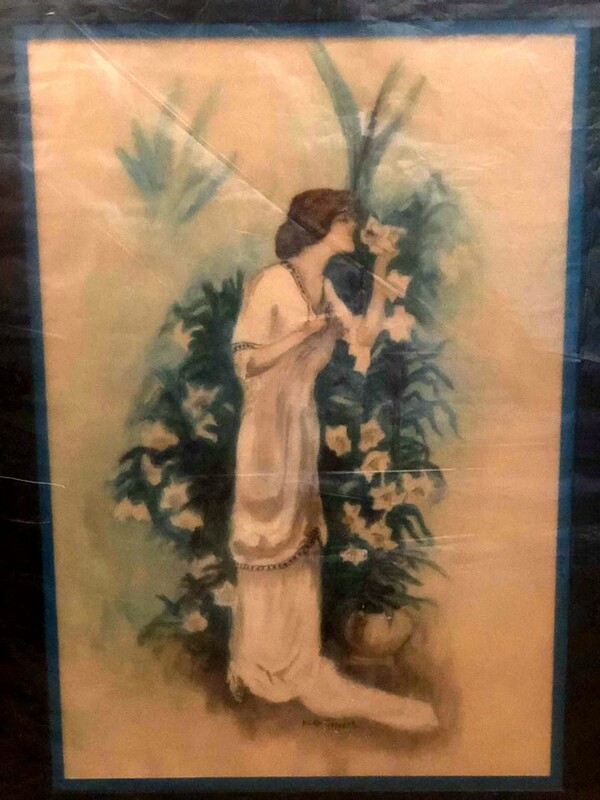 Grandma Dietz did, what I believe is cross-stitch, of a ballet dancer. After giving it to me, she told me she wasn't happy with the chartreuse background but I loved it! 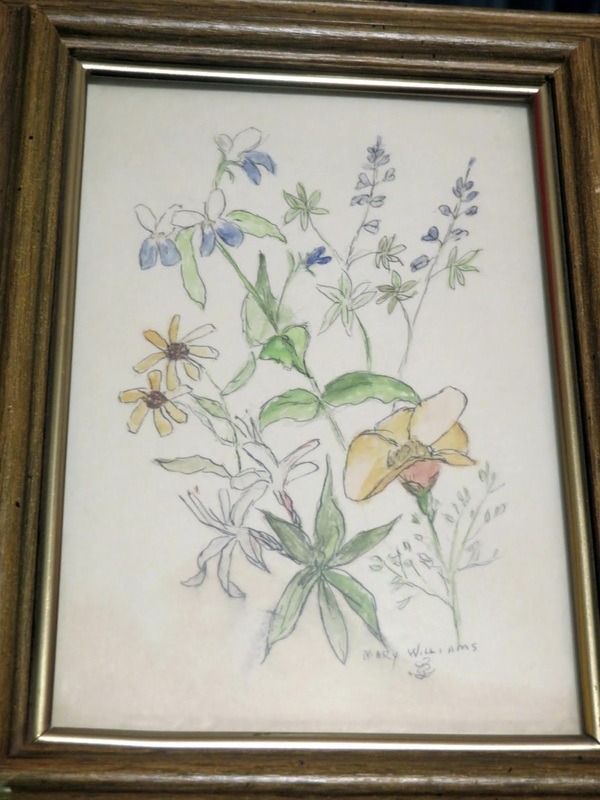 Years later, my mother gave me a flower that was also done in cross-stitch. Grandma Dietz was a talented knitter and made me many pairs of gloves, which I, being a kid, promptly lost most of them. All but one of the gloves usually. When I went out to California, I wrote her and asked if she would knit me a pair of gloves. I took a pencil and went around my hand and sent her the drawing. She told me it was the last pair she would knit for me. I cherished those gloves for years. I still think they are downstairs in the coat room but I can't find them but am still looking. I asked for them about 1963 and she passed away in 1968. There is one other memory I associate with Grandma Dietz and that is Christmas time. She always brought my brothers and myself a silver dollar. She brought her candied walnuts and we made caramel corn. I think I can still smell the caramel corn. Always was in a paper bag. Wonderful memories! Grandma Nilah Grinnell Howorth was my mom's mother. She had been divorced from Grandpa and when her other daughter Alice Louise Howorth Bednarek passed away, she went out to California to take care of her Grandchildren, Barbara, Pamela and James Bednarek. She was out there several years until my Uncle Jerry remarried. She then moved back to Michigan and came and lived with us. I shared a room with my Grandmother. Not easy for either of us but we managed. I knew Grandma Nilah was a wonderful seamstress but what I didn't know was what a wonderful painter she was. In fact, I don't remember how old I was when I found out she was a painter. I loved to draw and had a book "How to Draw Horses". A cousin and I used to draw from that book when she came to visit. I started an oil painting one time and was having trouble with the background. She was the one to tell me what to do. I don't remember when I got the water color pictures of the three ladies. 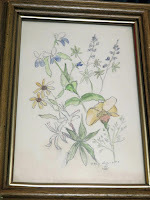 I love those watercolor paintings. 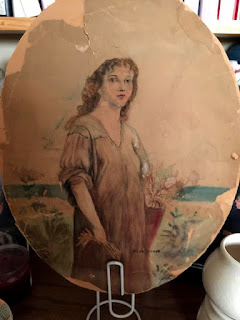 I loved them so much, I found an old Prudential calendar that had ladies with hats or just the faces and attempted to do them in watercolors. At the time, I had a ceramic shop, Sunny Ceramics. There was a lady I had worked with at Commercial Credit, previously, that loved those water colors. I made her a pitcher and bowl set and painted one of those ladies on the pitcher in underglazes and one-strokes. I was so proud of the way it turned out. I also did another one which I have in my bedroom. I think my mom gave me the ladies painting but then again it could have been Grandma. I honestly don't remember. When my mom passed away in 2018, I was going through the pictures, photos of family members and some papers. I packed up most of it and brought it home. I found five paintings. I did get one that was hanging there at mom's house. The rest were stashed in the drawer. Two were stashed in with some prints of birds. None of them were in great shape. Had some rips. I took the first one out to Hobby Lobby and they did a wonderful job of framing it. I eventually took all of them out there. I just recently found a watercolor of the head of a dog. 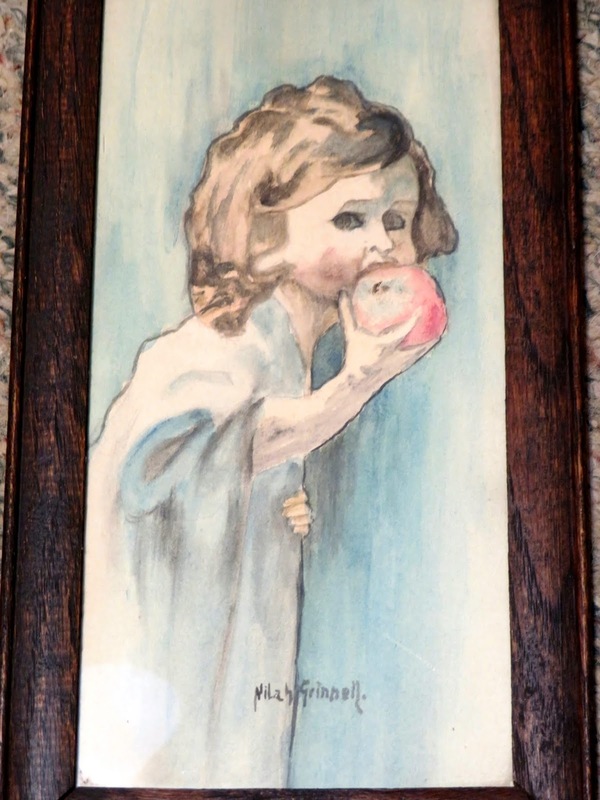 Not signed by Grandma Nilah, but I am sure it's her work. 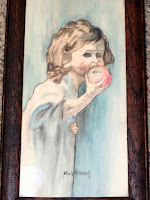 I also found out my cousin, Pamela Bednarek Wellcome has one painting signed by Grandma. I hope she gets it in a frame someday to preserve it. I have pictures to share with you. I know this is long and not about yards, gardens birds or critters but it's about some people I love and wanted to share their talent with you. Nilah Grinnell, would be over 100 years old. This is the painting my cousin Pamela has. I put just a tad of water on it and, yep, not a print but watercolor. it framed like mine and gave it to my daughter! I like to do pen and ink and tried the look alike on a ginger jar in ceramics. I carved the lion head into the greenware and used a black wash a product similar to one-stroke but put on greenware. Fired and then glaze was applied. 1980's sometime I believe.